Here at Sonoran Desert Eye Center, we are dedicated to finding the right type of contacts, even hard-to-fit ones, for our patients. There are many different eye conditions that require specific kinds of contact lenses, so a standard lens doesn’t always work for everyone. There are lenses designed for certain eye conditions, such as an high or irregular astigmatism, dry eyes, keratoconus, post surgical, and more. However, we believe that comfort is also very important when it comes to giving you good vision. 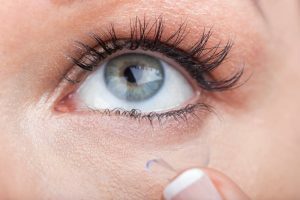 Soft contact lenses are a great option for most people. They allow the eye to breath and are very comfortable. Most soft contact lenses are disposable, so you can change them regularly to keep your eyes healthy. Corneal rigid gas-permeable contact lenses (RGPs) are small diameter hard contact lenses that create a smooth eye surface for clearer focusing in people with irregular corneas. However, they sit on the cornea so they can be somewhat traumatic over time, are not as comfortable, and may slide around easier. so adjusting to them can take a bit of time. They are durable and very good for people who struggle with bad vision. Scleral lenses are large diameter lenses that breath a lot of oxygen and create a smooth focusing surface, but don’t traumatize the cornea or slide around. They are very comfortable and durable. These are great lenses for people that have highly irregular corneas that can’t be fit easily with a small diameter RGP. Multifocal contact lenses have zones for distance, midrange, and near. They provide adequate distance and near vision, enabling the wearer to function without glasses for most tasks. However, there are some mild vision compromises that are tolerable for most people. We can now fit people with astigmatism in multifocals as well! Transitions Contact Lenses are soft contact lenses that get dark outside. These are excellent for people who play outdoor sports that make it difficult to wear sunglasses. Cosmetic Contact Lenses are lenses that change the look of your eyes. We have contact lenses that can enhance the color of your blue eyes, make your brown eyes blue, or visa-versa. There are also Halloween contact lenses available that can create a dramatic effects. We are able to provide these many cosmetic options. If you are interested in contacts, don’t hesitate to contact us today at (480) 812-2211.